Is A Pentastar V6 Coming To The Dodge Dart's Rescue? 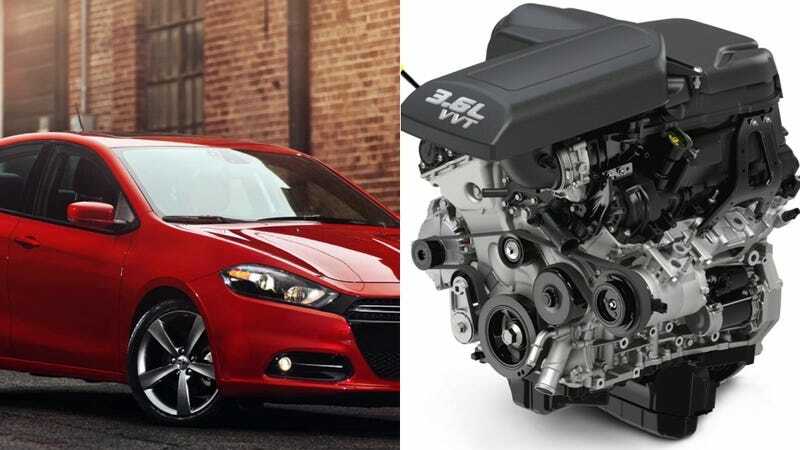 A non-boosted 2.4-liter four-cylinder mated to a conventional automatic is supposed to be the powertrain fix for the Dodge Dart in 2014 that will get the car on more people's shopping lists. But that might change if Chrysler engineers stick a V6 up front soon. Sources with Allpar say there's a group of Chrysler engineers currently trying to figure out a way to get a 3.0-liter version of the Pentastar V6 into the Dart in an attempt to add further power. The Pentastar is most commonly found right now as a 3.6 that's available in everything from the Grand Cherokee to the Avenger. The 2014 Jeep Cherokee carries a 3.2-liter version with 271 horses and that 9-speed automatic. There's a 3.0 version, however, which exists for markets that heavily tax engines that are greater than 3.0 liters – this one gets by at 2997cc. In the Chinese-market Grand Cherokee and Wrangler, it produces 234 horses and that's the motivation rumored to be wedged into a Dart. The 234 figure is a sizable leap over the 184 in the uplevel 2.4 engine. Allpar's sources indicate there are few problems with getting the Pentastar 3.0 in the Dart, space being the primary issue. Sticking a six-cylinder in also probably wasn't in the cards when Chrysler envisioned this as their Focus fighter, either. The fact that there is the wave of 2.0Ts out there producing more than 230 horses with superior EPA figures makes the possibility of a Dart V6 shakier. But we can dream, right? The Dart still has three other engine options that provide more typical compact sedan mileage and performance. And the idea of a naturally aspirated V6 in a (relatively) small car does conjure up memories of the old Jetta VR6s that had gobs of smooth power. Actually, it probably makes Chrysler fans remember the Plymouth Sundance-based Duster of the early '90s.